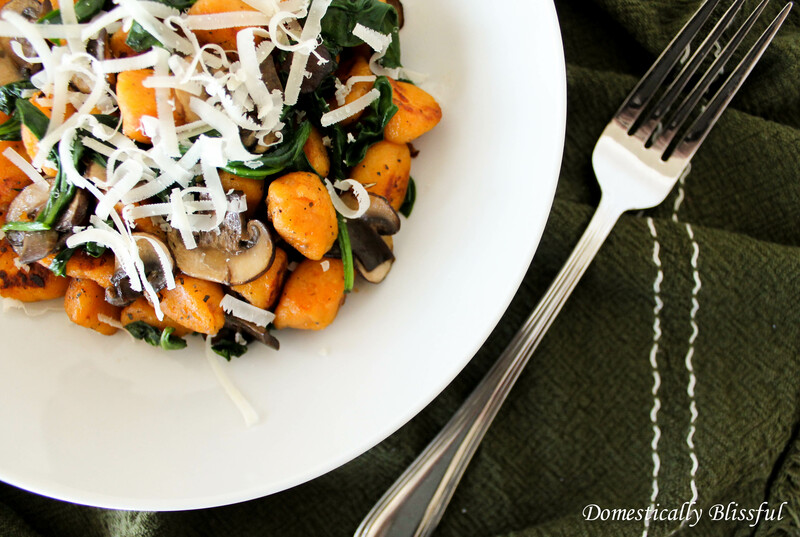 There is a special place in my heart for sweet potato gnocchi and I have been looking forward to sharing this recipe with you ever since I gave you that sneak peak on Instagram last week. One of my favorite ways to eat sweet potato gnocchi is when it is covered in my husbands homemade Gouda Cheese Sauce. The only “problem” is that I usually make more gnocchi than he makes sauce. This Fried Sweet Potato Gnocchi is the perfect answer to the question of what to do with left over Sweet Potato Gnocchi. First, melt the butter in a pan at medium heat and add the Baby Bella Mushrooms making sure they do not overlap. Sprinkle the mushrooms with a pinch of salt and pepper. 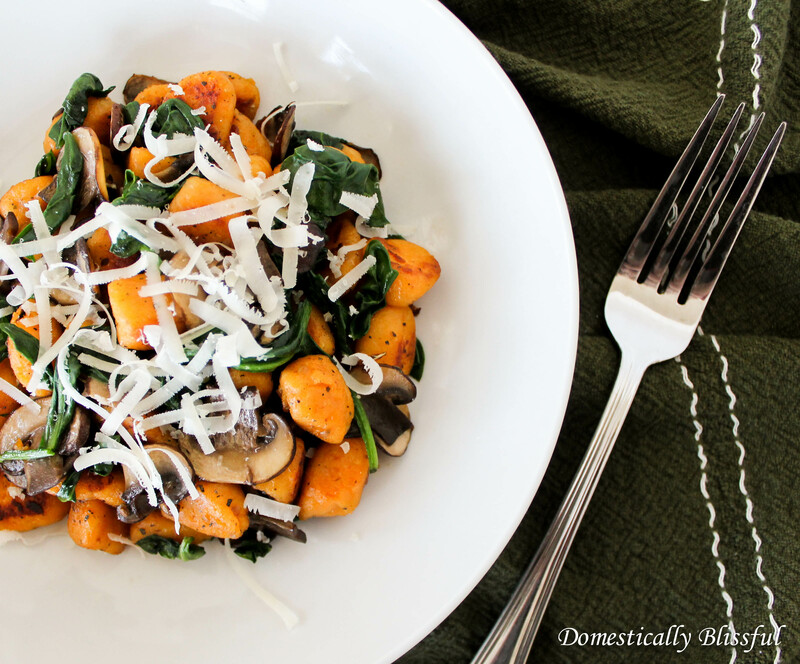 Once the mushrooms begin to look golden brown on each side – about 3-5 minutes – add the cooked Sweet Potato Gnocchi. Fry the gnocchi, stirring occasionally, until it has a nice golden brown shell. I use leftover Sweet Potato Gnocchi that has been in our fridge so it takes a little longer to heat up before it begins to become golden. While frying the gnocchi you can either take out the mushrooms so that they do not overcook or push them to the side of the pan away from the heat. Add the spinach to the pan – my hands are on the small side so I usually do large handfuls of spinach because the spinach will wilt down – let it wilt down by placing the hot gnocchi on top of the spinach, then sprinkle with 1/8 heaping teaspoon of Crushed Dried Basil. Enjoy with a sprinkling of freshly grated parmesan! 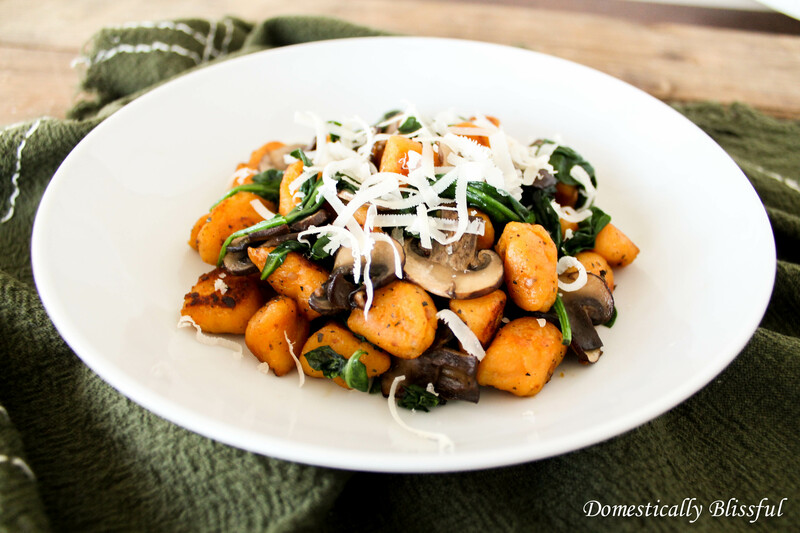 One of my favorite things about this Fried Sweet Potato Gnocchi is that the gnocchi, spinach, and mushrooms are already so flavorful very little seasoning needs to be added to them. 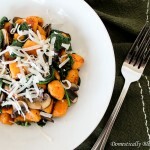 If you love gnocchi as much as me be sure to check out these other gnocchi recipes! I’d love to see your Fried Sweet Potato Gnocchi! Instagram your yummy gnocchi with the hashtag #DomesticallyBlissful and you might find your picture featured on DB’s Instagram! Fry the gnocchi, stirring occasionally, until it has a nice golden brown shell. Add the spinach to the pan, let it wilt down by placing the hot gnocchi on top of the spinach, then sprinkle with 1/8 heaping teaspoon of Crushed Dried Basil. My hands are on the small side so I usually do large handfuls of spinach because the spinach will wilt down. I use leftover Sweet Potato Gnocchi that has been in our fridge so it takes a little longer to heat up before it begins to become golden.